Search Results for "elephant trunk"
Closeup of Elephant Trunk. Slow Motion. Elephant Eating Grass with the Help of Trunk. SIGIRIYA, SRI LANKA - FEBRUARY 2014: View of an elephant eating banana trunk in Sigiriya. These old elephants are retired from log working and converted to amusing tourists. 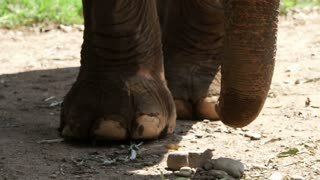 Aerial view of elephant ride with little girls legs resting on elephant?۪s head and trunk lifting to reach for fruit. United States: 1940s: boy sits on back of elephant. Girl in playpen watches boy ride elephant. Boy slides down elephant trunk. Girl in crib smiles. 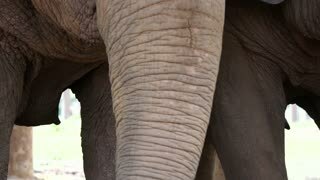 Elephant lifts back leg. 1930s: Man climbs up elephant's trunk, mounts elephant. Intertitle card. Men stand by elaborately painted elephants. Soldiers march by. 1930s: Man stands on elephant, takes blanket from elephant's trunk. Intertitle card. Man sits outside tent. Man rides elephant around tent. 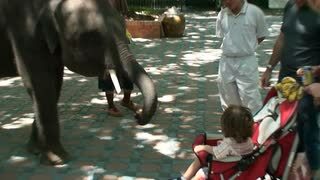 A tourist stroking a baby elephant's trunk at an elephant sanctuary in Chiang Mai, Thailand. POV. 1940s: Elephant trunk drinks water from bucket. Woman trims pony’s hair. Man cuts hair of man who sits inside circus arena. Woman washes clothes by hand. 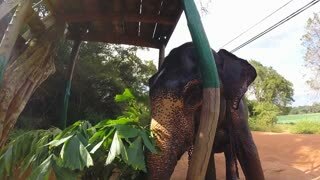 Elephant lays on the ground and gets a shower. UNITED STATES 1940s: Woman with elephants in circus ring, climbs onto elephant's trunk. INDIA 1950s: Boy with elephant mother and baby / Boy holds baby elephant's trunk. 1940s: Elephant exhales steam from its trunk. 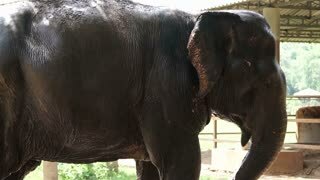 Woman pats elephant. Dwarf brings giant telephone to elephant, the elephant grabs the phone handset with its trunk and holds it up in circus arena. Male tourist stroking an elephants trunk in Thailand. Point of view. 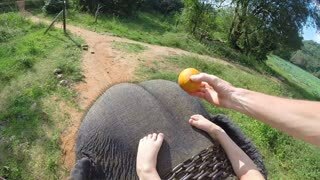 A persons hand offering an elephant trunk a piece of fruit. 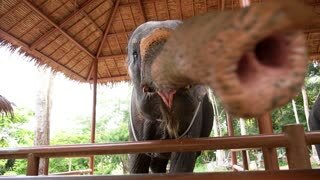 Tilt up from Elephant trunk and feet to face. Male tourist stroking an elephants trunk in Thailand. POV. Elephant trunk digging around and playing with his food in a large bowl. 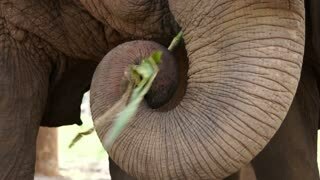 Hands reaching out to touch and elephant trunk in slow motion.